ANN ARBOR — John Beilein is staying at Michigan after exploring the possibility of coaching the Detroit Pistons. 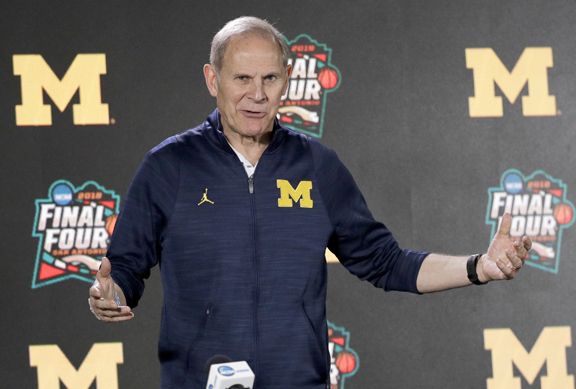 Beilein interviewed with the Pistons, a person with knowledge of the situation told The Associated Press last week on condition of anonymity because he was not authorized to speak publicly about the matter. The 65-year-old Beilein has coached at Michigan for 11 seasons with a 248-143 record. He has led the Wolverines to two Final Fours, losing in the national title game this year and in 2013. Beilein has won a pair of Big Ten championships and two Big Ten Tournament titles. The Pistons have made the playoffs only once in nine years after advancing at least to the Eastern Conference finals six straight years, winning the 2004 NBA title and falling a victory short of repeating as champions in 2005. Detroit has been looking for a coach for a month since firing Stan Van Gundy, who was also its president of basketball operations. Long considered one of college basketball’s top offensive minds, Beilein is 799-461 in 39 seasons. Beilein made Division I stops at Canisius, Richmond and West Virginia before moving to Michigan.